Scotland: Edinburgh, Adam Mausoleum. Academic study for a section through a mausoleum of three bays, divided by semi-engaged columns with spiral fluting on a base of relief sculpture, with three statues of seated figures in niches. Above is more sculpture and a coffered and compartmented dome with oculus. You are here: CollectionsOnline / Scotland: Edinburgh, Adam Mausoleum. 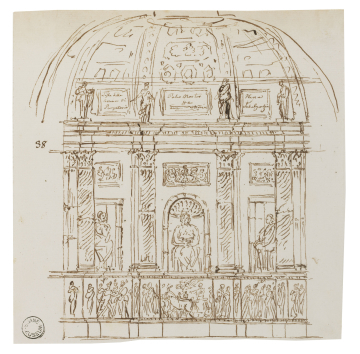 Academic study for a section through a mausoleum of three bays, divided by semi-engaged columns with spiral fluting on a base of relief sculpture, with three statues of seated figures in niches. Above is more sculpture and a coffered and compartmented dome with oculus. This is an enlarged version of the section shown in Adam vol.55/37 through the unbuilt scheme for the Adam Mausoleum in Edinburgh, Scotland. The three plaques between the column capitals are inscribed: 'Lista delle anime di Purgatorie'; 'Pater Noster de Ave Maria'; 'Plena et[?] Indulgenzia', all of which would have made strange reading in a Protestant churchyard. In Adam vol.56/2 there is a view by Robert Adam of the Mausoleum in Greyfriars' Churchyard, Edinburgh that was completed in October 1755; there is also a pencil drawing for the 'Adamian Sepulchre' in the Blair Adam Collection (BA 201); both predate the scheme shown here, which is probably 1756-57.